A colour photograph of the west side of the last remaining Camp X building located at 4680 Thickson Road, Whitby, Ontario. 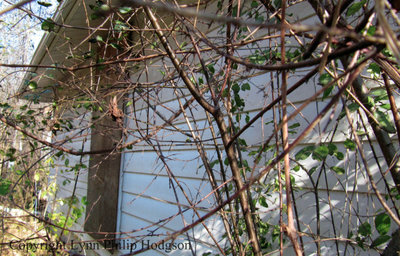 In this view the door of the building is boarded up and there are tree branches blocking the view of the door. The West Side of the Last Remaining Camp X Building, c.2012, Lynn Philip Hodgson. Whitby Archives A2017_014_003.